Corn Processing Refinery Is "Manufacturer Of The Year"
West Burlington, Iowa - Henderson County's Ray Defenbaugh, CEO of a booming ethanol business, can proudly look back and see that building a corn processing refinery was one giant step for the farmer, the economy, and for America as it continues to reap profits and awards for its many successes. From coast to coast and around the world, bio-fuels and refineries are turning heads, but Defenbaugh says it is especially rewarding to know that locally, people are pleased with the remarkable success that has been going on at Big River Resources. "And he did not do many miracles there because of their unbelief" (Matthew 13:53-58). 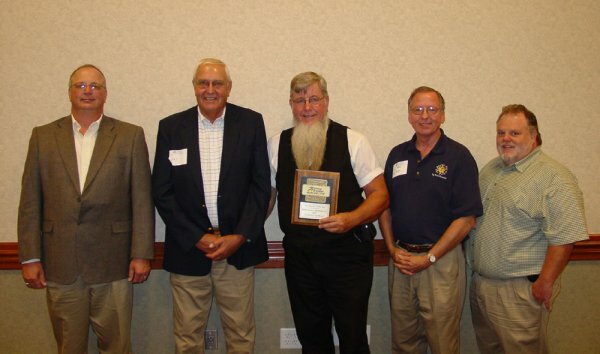 Defenbaugh and his board received local recognition Friday noon at the annual Manufacturer's Appreciation luncheon where he accepted an award for Big River Resources LLC, West Burlington, Iowa. 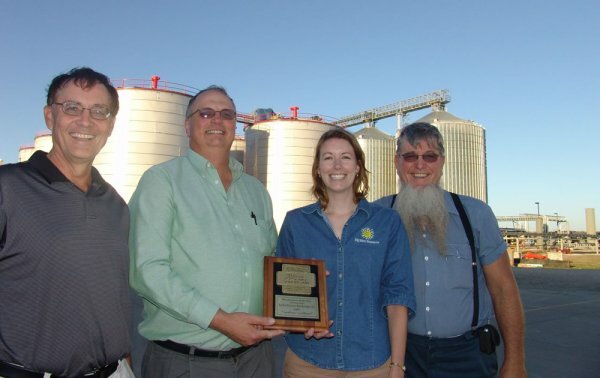 The corn processing plant was named MANUFACTURER OF THE YEAR by the Burlington/West Burlington Area Chamber of Commerce through its economic development division, Grow Greater Burlington. If still alive, Bill Gunter would be proud, Defenbaugh said, as he was the first investor from Kirkwood to put money into the cooperative as an investor adding that he would be praying daily for its success. Gunter passed away in February 2007, but was able to reap back his investment in dividends and see the value of his investment triple as shares sold at three times their initial cost. Bill's son, Jim Gunter remains on the Board of Directors. This fall, the ethanol plant is completing a major expansion taking it from a 52 million gallon corn processing refinery to 92 million gallons and from a producer of 167,000 tons of dried distillers grain to 257,000 tons of "DDG". They are also putting in an additional rail of 75 to 100 cars to handle the expansion which gains them sizable discounts when trains pick up their cars and ship them to various points such as Texas, California, Georgia, and Mexico etc. Big River Resources opened in 2004 with its $17 million plant at rural West Burlington, Iowa with plans for expansion. The Iowa location was chosen over a Henderson County site due to three important factors, rail, water, and electricity. Illinois Power was unable to provide the needed electricity at the Illinois site they had planned on building at. It was earlier this year, "Big River" kept true to their construction plans and began a $64.5 million expansion project which added about 25 jobs to the 42 workers for a total of 67 full-time employees at Big River Resources and an additional slew of part time harvest help. Employment figures are way over the initial grant request that estimated 21 employees in its early calculations. Its 67 full-time employees creates an annual payroll of more than $2 million a year. The present expansion at West Burlington is to be completed this fall and will increase the amount of corn it uses from 19 million bushels to 30 million bushels, plus 5-8 million bushels that will be purchased at Monmouth Grain & Dryer facilities in Warren County which is owned by Big River Resources, West Burlington, LLC. According to Defenbaugh, the 5 million bu. capacity storage units at Monmouth Grain & Dryer will actually purchase 8 million bushels as they keep moving corn out of the bins and onto the refinery at West Burlington, Iowa. Altogether, with the West Burlington expansion,around 35 to 38 million bushels of corn will be purchased with a projected 11-cent increase -- over $4 million in additional money for area farmers than they would have received at regular markets. Big River not only increases corn prices for investors, but for all corn producers. Gross sales at West Burlington, are expected to increase from $100 million to $175 million. The 2007 Manufacturer Award was awarded to Big River "because the ethanol facility will be adding a significant number of employees after the expansion and also will contribute greatly to the area's economy, and because the distribution of dividend payments to area investors represents additional income that will circulate through the local community," the Burlington Hawk Eye reported. Big River and its employees also are involved in community events such as West Central Art and Henderson County Historical Society, I-Lead Program, Junior Achievement Sponsor, HCHS Pork Chop BBQ, Band Fest 2007, Ladies Galva Day, Special Kids Rodeo 2007, DMC Fair, Galva Days 2007, 7th Grade Farm Safety Day, YMCA Youth Membership, Des Moines County PheasantsForever, Relay for Life, Bowl-A-Thon, Boy Scouts, Girl Scouts, Junior Achievement, Special Kids Rodeo, American Cancer Society, Farm Safety Camp and National Fire Safety Council. About 160 people attended the luncheon which was held at Comfort Inn & Suites located south of Burlington, IA. Big River Resources LLC is a holding company run by shareholders with the majority of investors farm producers. Besides the expansion at West Burlington, they are in Phase I of building a 100 million gallon ethanol corn processing plant inside the grain loader at Galva. They have invested in a joint venture in a 100 million gallon ethanol plant at Grinnell, Iowa, and have invested in a 100 million gallon plant that will start producing alcohol in St. Ansgar in January where Defenbaugh sits on the board of directors. Finally, they have invested in a 100 million gallon ethanol plant at New Hampton, Iowa. What is unique about this facility is they will be converting coal to gas and using that source to power the plant. Pictured above is Big River Resources West Burlington LLC's from left: Jim Leiting (General Manager), Andy Brader (Vice President), Raymond E. Defenbaugh (President CEO, Chairman), Les Allen (Treasurer), Stan Janson (Plant Manager). From left is Big River Resources West Burlington LLC Comptroller Jim Hall, General Manager Jim Leiting, Assistant Comptroller Deborah Green, and President, CEO, and Chairman Ray Defenbaugh holding their recent Manufacturer Of The Year award given by Burlington/West Burlington, Iowa Chamber of Commerce Friday.